My husband and I rented out our basement “mother-in-law apartment” to a friend of ours for the past few years. He recently purchased his own home and is in the process of moving out. We have already rented the apartment out, and the new tenant will be here in a few days. In the meantime, I had the opportunity to go into his bathroom to assess its condition. He said he cleaned his shower, but it is filthy. There is soap scum and mold everywhere! It is really disgusting, and I’m not looking forward to hours of scrubbing. Is there anything available that will help me to remove the buildup? It is REALLY BAD! I read your mold-removal technique, and I have bleach and tea-tree oil at home, and I plan on trying that first. Another question: Can I use them together? Here’s what happened: A mutual friend of ours was helping a couple we all know move out of their apartment. He snapped a photo of their empty bathroom, which had apparently not ever been cleaned in several years. It was a horror show. The tub was the color of old butter. It sort of looked like maybe it had been spread with old butter, in fact. The shower walls were covered in mold, mildew, and a layer of soap scum so thick that it was clearly visible even in the crappy camera-phone photo. It was so vile, oh my God. And so, given these two events, I figured that while I’ve covered bathroom-cleaning in this space before, it was still worth putting together a more comprehensive post on what to do when confronted with a truly nasty sitch. Let’s start by reviewing the existing literature. These posts tend to address one very specific subject, though some are broader than others. Part of the reason I was excited to take this question on is that I realized that, while I’ve spent a lot of time talking to you about what products to use when it comes to getting your bathroom clean and lovely, I’ve not dedicated a lot of space to some of the tools that can really help the process along. I do, however, often mention rubber gloves. I’m doing so again: When working with the kinds of cleaning products that we’re going to talk about today, you absolutely must wear protective gloves. Opening the window is also really important—fumes, you see. The thing is that the gloves serve another purpose in that they keep your flesh from having to make contact with the nastiness you’re trying to clean. Don’t underestimate that! The gloves make things so much more humane. Because we’re talking about shower walls and a tub that have developed a fairly thick buildup, some sloughing power will also greatly help matters. A scrub brush will let you scour walls and grout; my old pal the Dobie Pad is another great option, especially if your shower is fiberglass, as it scours without causing scratching; for straight tile or porcelain, a Scotch-Brite Scouring Pad will also go a long way in scrubbing scum away. Finally, get yourself a squeegee. This Cleret number comes highly rated on Amazon and is under $15, so it won’t break the bank. 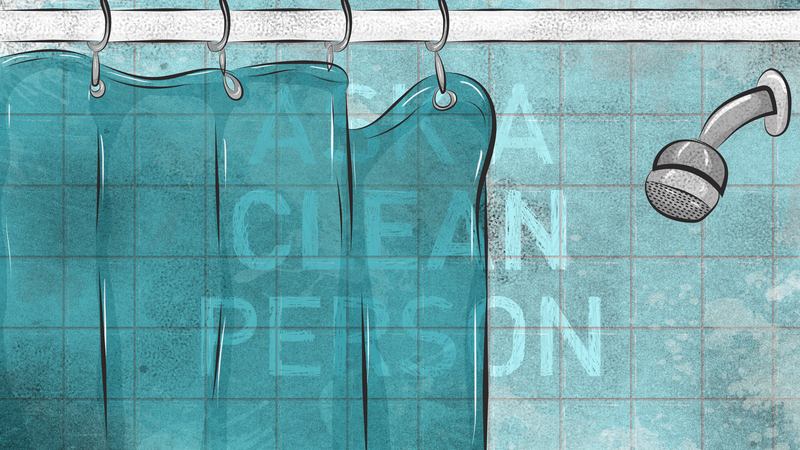 The squeegee is going to help you to get your shower walls—and, if you have them, your glass shower doors—extra spotless-looking. The squeegee will help if you also notice that the bathroom walls are nasty; use an all-purpose spray cleaner in concert with the squeegee to easily wipe away aerosol-effect buildup. They’re also helpful when it comes to doing the final rinsing-away of all those caustic cleaning products I’m about to tell you to use. Put the tea-tree oil down. That stuff is pricey, and it isn’t going to be powerful enough to touch the mess your tenant-friend left behind for you to clean up. To answer your question, though, yes, you can mix bleach and tea-tree oil. But don’t: There’s no reason to do so. The deal with tea-tree oil is that it’s a natural alternative to bleach. If you’re down with using bleach, then there’s no reason to bother with the expensive and weaker alternative. But I actually don’t want you to use bleach, either. Bleach is fine. But I actually recommend something gnarlier. Guys, I love this X-14 stuff so much. I don’t know what it’s made of (and I don’t actually really want to know), but oh, man, it works so well. I’m not the only one who feels this way either! I mean, look at these Amazon reviews. But it’s nice to have choices in life, so as much as I want you to share in my love of X-14, there are certainly other options. One product that gets similarly high marks from Amazon users is Zep No-Scrub Mold and Mildew Stain Remover. I haven’t used this particular offering from Zep, but I have used other products, and they are quite good—and quite heavy-duty. So I feel perfectly confident in recommending this to you. The last product to mention—though I want to note that there are many, many good cleaning products out there that I’m not including, because otherwise we’d be here all day—is the Magic Eraser. Now, the Magic Eraser is not a thing you’re going to use for any of your heavy-duty cleaning; rather, it’s what you should get if, after all the scrubbing and squeegee-ing and inhaling of fumes, there is minor staining left behind. The Magic Eraser will be the ticket for those little discolored spots. Soap scum is different from mold and mildew. In its way, it’s worse—I find it way more stubborn to remove than its furry green friends. But I have a trick! (Of course I do.) I’ve shared this before, but I feel like I’ve always sort of buried it, and it deserves a place in the sun because it’s so weird and it works so well: Grab a dryer sheet, get it wet, and use it to scrub scummy glass, tile, or fiberglass walls and tub interiors. It’s SO BIZARRE. But it totally works. This is also a technique that benefits from having a squeegee on hand; the scum will loosen from the surface it has adhered to, and the squeegee will help you to scrape it away. My only concern with the dryer-sheet technique is that, in this particular situation, it may be cumbersome and require a huge amount of work on your part to cover the entirety of the scummed-up area. In that case, try Bar Keepers Friend Cooktop Cleaner combined with a scrub sponge; when I was putting all this together, I recalled a post I’d read years ago in which a blogger tested out a bunch of ways of removing soap-scum buildup, and the BKF was his top choice. So! If you start down the dryer-sheet path and are like, “Oh damn, this is gonna take foreverrrrrr,” try the alternatives to save yourself some work. When it comes to cleanup, you’ll really want to mind the “work from the top, down” rule. Whatever you clean off the shower walls will end up in the tub, so if you start with the tub, you’ll end up wanting to kill yourself for your lack of foresight. The other thing is that you’ll probably want to wear shoes of some sort while you work on the shower walls, since you’ll have to stand in the tub, and you don’t really want all that mess (or those cleaning products) making contact with your feet. If you get in there and find that this process requires many, many man-hours, here’s a shortcut that may help you get the tub cleaner, faster: Fill it up with hot-hot-hot water and add a scoop or two of OxiClean. Let that sit for 30 to 60 minutes while you work on the sink, toilet, or bathroom walls, and then drain the water and scrub away. The soak will loosen a lot of the grime and scum, and should make the cleaning process a bit easier. A similar technique can be used on tile floors. Mix a gallon of water with a scoop of OxiClean and pour it in a thin layer on the floor. (Don’t flood the joint!) Taking it in sections heading toward the door, work the Oxi solution into the tile and grout with your scrub brush, then allow the solution to sit for 30-60 minutes before mopping up the water with dry rags or a sponge mop. The grout may not immediately look brightened, but as it dries, you’ll notice a HUGE difference, all without the agony of scrubbing with a toothbrush. YOU’RE WELCOME.